Construction and Launch of the Sophie C.
The Sophie C. Excursion Vessel which still plies the waters of Lake Winnipesaukee was named for Byron Hedblom's mother Sophie C. Hedblom. Below is Byron Hedblom's recollection of the boat's origins.
" We were being pushed [At the end of WWII, n 1945] by the New Hampshire Public Utilities Commission as to when we would resume operations by the Mount Washington. We answered, as soon as engines could be obtained. [The Mount's engines and boilers had been taken by the Navy for the war effort]. We decided to build a 65-foot boat to run short excursions from the Weirs to Wolfeboro, until the Mount Washington was running. I designed a vessel to carry about 150 passengers. We had a General Motors diesel engine, which we could convert from Electric Generation to Direct Reversing Mode. We also had steelworkers available for the job. We built the hull in the Mead Morrison shop, installed the engine and trucked it to New Hampshire where we finished it. 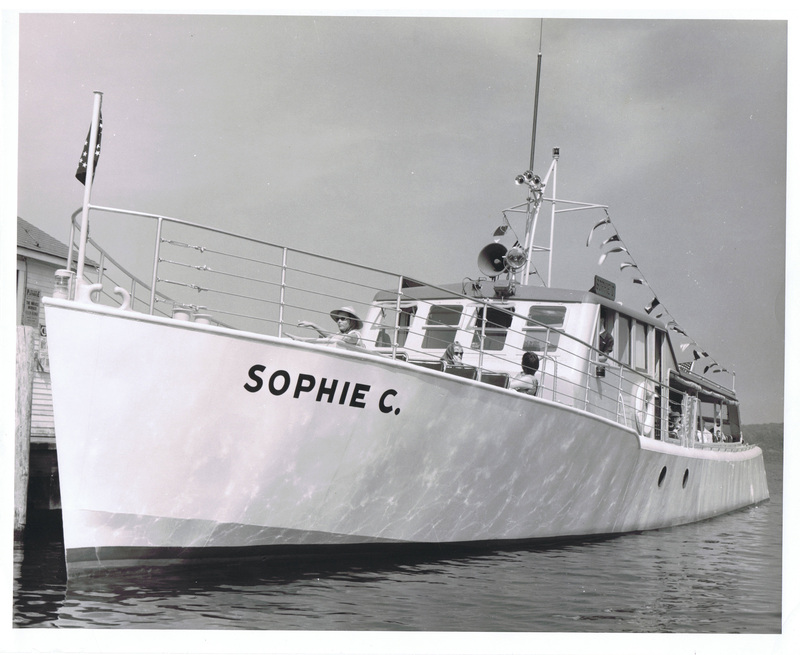 We installed the superstructure in New Hampshire, launched the boat fully completed and named it “Sophie C” in memory of my mother. We had a trial trip on VJ day in 1945. It was very successful and it went into service immediately. At the same time, we built a 45-foot service boat for carrying men and materials to ships away from our plant. The boat was called “General.” After it was completed and tried out, my father said send it up to Lake Winnipesaukee it’s too nice to use for a service boat. We all made very good use of it. We were also sponsoring a Little League Baseball team. Our foreman electrician took care of the running of this operation and did very well."